The ChiaoGoo TWIST 4 inch RED Lace Small interchangeable set features the same stainless steel RED Lace needles and cords that you know and love. The needle tips feature a lifeline hole that makes adding a lifeline as simple as knitting across the row. The sets come packaged in an elegant black and white case with a red ribbon. The case is compact (6" x 8" closed) with 29 inner pockets for tips and one outside zippered pocket. 7 pairs of 4 inch (10 cm) needle tips. US sizes 2, 3, 4, 5, 6, 7, and 8 / Metric sizes 2.75, 3.25, 3.5, 3.75, 4, 4.5, and 5 mm. (2) 8 inch (20 cm) "S"
(1) 14 inch (35 cm) "S"
(1) 22 inch (55 cm) "S"
One elegant, compact fabric case for storage. Note: 5 inch tip sets and additional cords including longer lengths are available in our store. 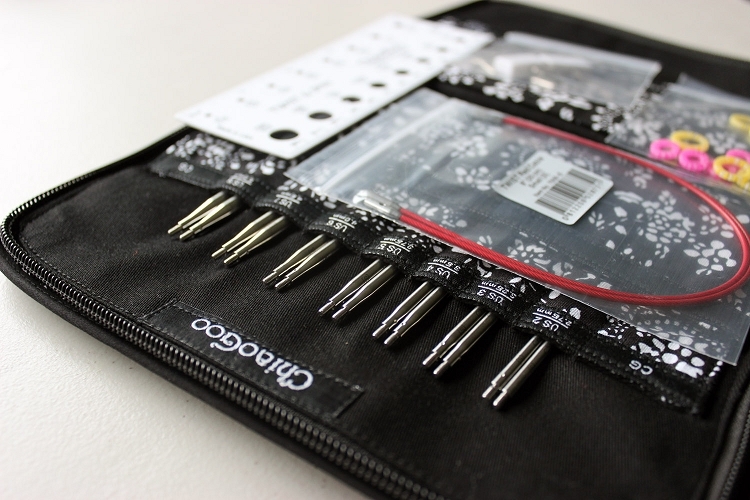 Q: Do all ChiaoGoo needles have the same tips regardless of needle size? Looking for sharp points. The ChiaoGoo tips that are labeled as Twist "Lace" tips have the sharpest and pointiest tips. The ChiaoGoo Regular Reds (circulars only) have regular tips. Not as sharp or pointy as the lace tips in the interchangeables and fixed circulars. You will want to stick with the lace tips for the sharpest points. 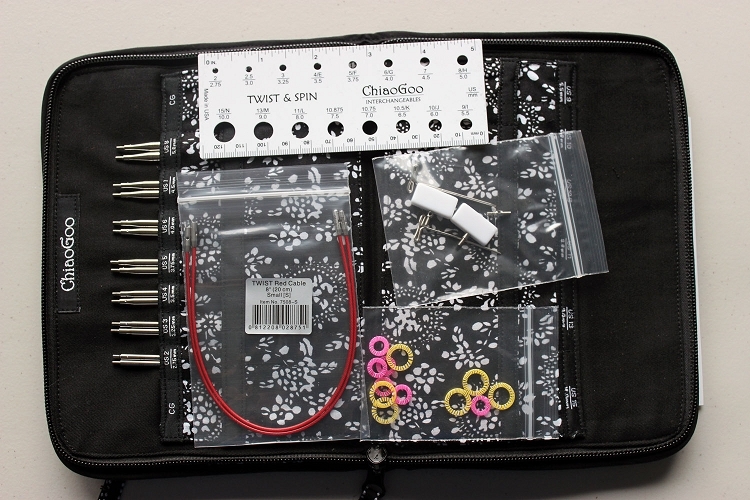 Q: Does this Chiaogoo set (7400 S) come with a 14" & 22" cable , along with the two 8" cables? Q: Are extra cords available for this set? If so, could you provide link? Thanks. Q: Are these considered short special needles, like for hat knitting? Q: I am having a trouble having my 11" needles. Do your interchangeable needles have a longer grip?